Congratulations to all the very lucky winners! You are in for a treat. To claim your prize, please contact me with your full name and address by October 3, 2012. Shipment to US addresses only. 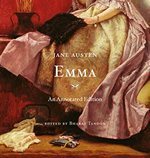 Emma: An Annotated Edition is a sumptuous new illustrated edition of Jane Austen’s classic novel from Harvard University Press who kindly contributed the books for this giveaway. Many thanks to all who left comments. I loved reading your replies. Happy reading to the winners! Thank you so much-I just sent you my mailing address and am so looking forward to adding this delightful book to my Jane Austen collection! Look at me,getting all Miss Bates about this-thank you again! Congratulations to the winners! I fear I am jealous of you. But I wish you many happy hours as you read this book. I have come to love and appreciate annotated editions of Jane Austen’s novels. They come so much more to life for us when we can access explanations as to why x,y, and z were so significant when they are not in our lifetime or are nonexistent in our lifetime. Yes, it interrupts the story if you are really bent on just reading the story. But sometimes the time is right to read the story and the annotations that make the story come alive for us so much more. Enjoy!